Bosco Verticale are a pair of residential towers in Milan, Italy, designed by the Stefano Boeri, an Italian architect and urban planner. Bosco Verticale (English: "the Vertical Forest") is an amazing architectural concept of creating a vertical forest in heavily populated urban area and has been billed as World’s First Vertical Forest. 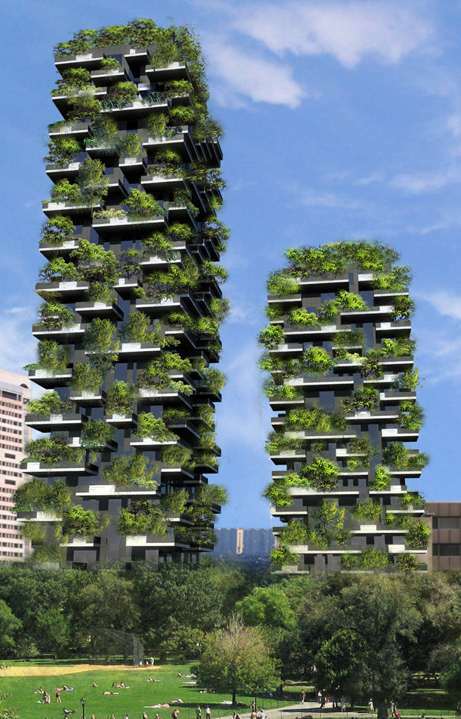 The first tower has height of 110 metres (360 ft) and hosts 550 trees on its 1.3 metres wide concrete balconies. The second tower with a height of 76 metres (249 ft) has 350 trees. In addition to these trees, which have a height varying from 3 - 6 metes, the green area also have about 5,000 shrubs, and 11,000 perennials. Scaled model of the building was tested in wind tunnel to ensure that the trees don't topple during high winds. 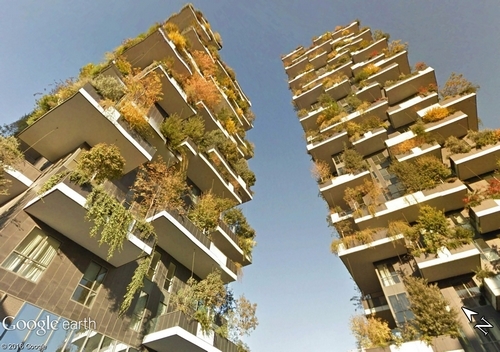 "The Bosco Verticale is a system that optimizes, recuperates and produces energy. 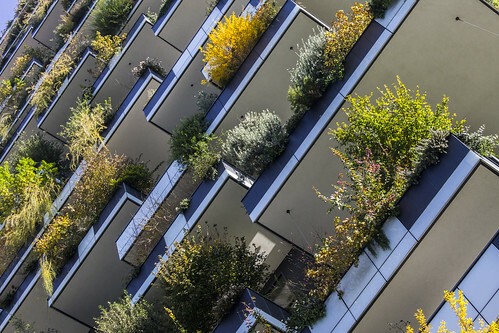 The Bosco Verticale aids in the creation of a microclimate and in filtering the dust particles contained in the urban environment. The diversity of the plants and their characteristics produce humidity, absorb CO2 and dust particles, producing oxygen and protect from radiation and acoustic pollution, improving the quality of living spaces and saving energy. Plant irrigation will be produced to great extent through the filtering and reuse of the grey waters produced by the building." 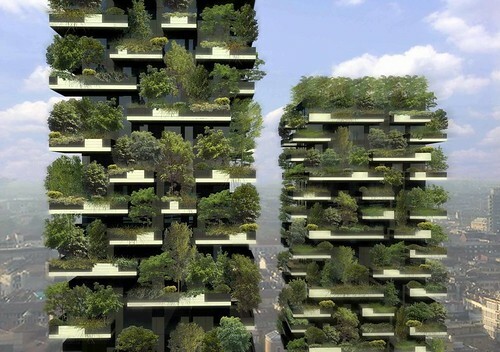 The concept of Bosco Verticale has received world wide acclaim and has received the 2014 International Highrise Award as well as "2015 Best Tall Building Worldwide". View location in Google Earth / Google Maps and Street View.